List of the most common types of bread and pastries. 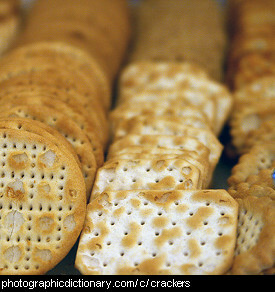 In some countries, a biscuit is another word for cookie. 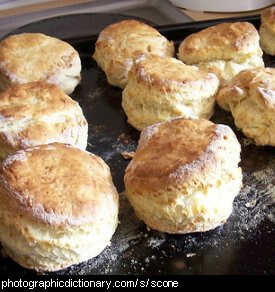 And in some countries, it is another word for a scone. Bread is a kind of food that is baked in the oven. 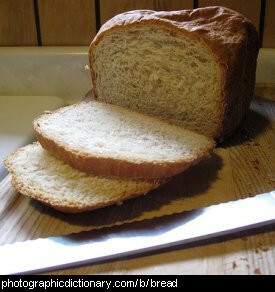 Bread is usually sold sliced, and you use the slices of bread to make sandwiches. A bun is a small bread roll. 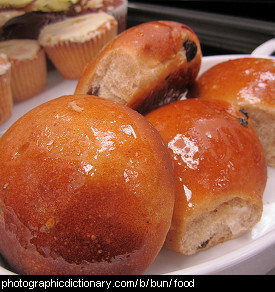 Buns are usually sweet, and often have dried fruit like raisins in them. Buns are typically eaten without any kind of filling as a snack or dessert. 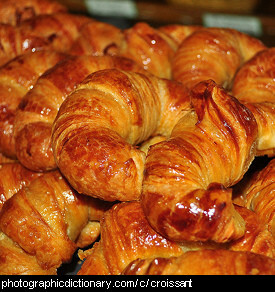 A croissant is a French pastry made from layers of yeast-risen puff pastry and butter. It is made into the shape of a crescent moon. A crumpet is a bread snack made from flour and yeast. Crumpets are usually round, flat on one side and covered in holes on the other side. 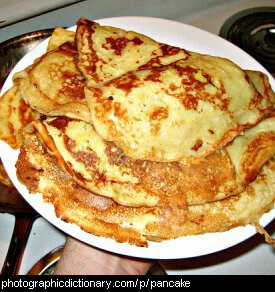 They are usually eaten hot with melted butter, jam or honey, and sometimes with eggs or cheese. 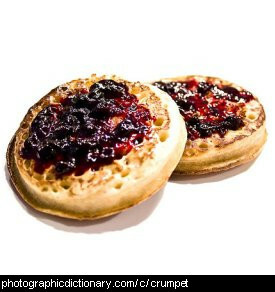 Crumpets are usually only found in Britain and Australia. 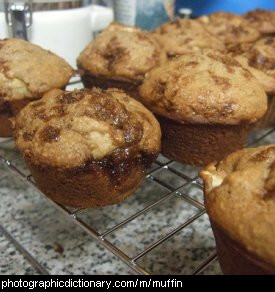 Muffins are small portions of bread or cake, baked in a distinctive shape. They are usually made of cornmeal in the United States, or wheat flour elsewhere. 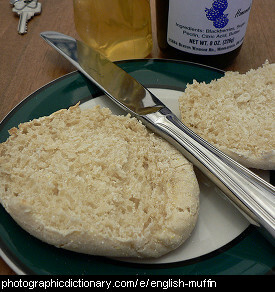 English muffins are very different to the apple muffins in the photo. Muffins are often flavoured with something else. The most common are chocolate muffins, blueberry muffins and choc chip muffins, but people have come up with almost every combination imaginable, from cinnamon to peach to banana muffins. Which varieties have you tried? 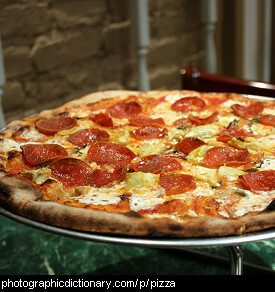 Pizza is a flat, round piece of bread, covered in tomato sauce and lots of other toppings.